Quickie Summary: State “Trunk” Highway 164 is an increasingly major road connecting points in the fast-growing far western burbs of Milwaukee. 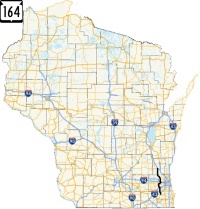 A great connector for other drives, 164 itself serves Waukesha, Waterford and the Holy Hill area and is one of the more controversial roads in Wisconsin due to plans for widening on long stretches. Highway 164 starts just north of Waterford (pop. 4,048). Originally known by its Potawatomi name of Tichigan (like the lake just to the northeast), Waterford is now named partially due to its narrow crossing point over the Fox River at Main Street (where one could easily, as they used to say, “ford the water”.) Downtown features stores and bars a’plenty and some nice parkland along the river. Highways 20 & 83 run through Waterford, and Highway 36 runs along its eastern edge. At the north edge is the junction of Highway 164, where it begins. Highway 164 southbound ends at Highway 36. Straight ahead is County K, which eventually meaders to Racine. Highway 36 north takes you to Milwaukee; southbound, you hit Waterford and Burlington. Highway 164 begins, heading north from Highway 36. Rolling hills and then Big Bend are up first along the way before Waukesha and other places beckon. To the west of Highway 164 is the Fox River, which expands into Tichigan Lake and the Tichigan State Wildlife Area. Tichigan Lake grew from an 1838 dam on the Fox River, and the marshland and lakes offer great fishing (particularly trout) and wildlife watching a’plenty, including a wide variety of birds and Blanding’s turtles – a relatively rare find. It’s also part of the Great Wisconsin Birding & Nature Trail. There’s a big bend on the Fox River a few miles further north, and that’s where you’ll find Big Bend (pop. 1,278). The first sawmill went up on the bend in the river in 1831, though incorporation didn’t happen until 97 years later. The water here was always considered of the highest quality; in 1893, a nearby spring (called Hygeia Spring #2) was the source of water that was sold in Chicago (for a penny a glass) at their World’s Fair – as an example of how water should be. 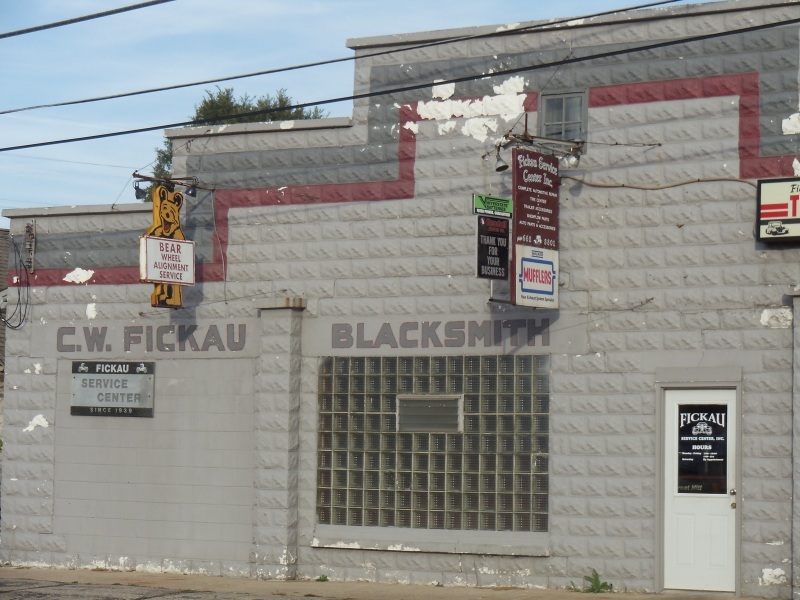 While it’s nothing major to look at nowadays, the intersection of Highway 164 and County L – once Highway 24, has some history. Dating back to the 1800s and before, this was the intersection of the Milwaukee and Prairieville Trails. “Prairieville” was Waukesha’s original name. In Big Bend, several 19th century buildings remain and their histories are evident. Obviously this building has had renovations since, but this former blacksmith shop is now an automotive service center. 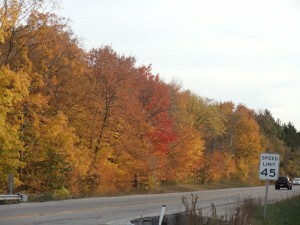 Fall is a nice time to ride along 164. This stretch is between Big Bend and I-43 and provides plenty of color. Shortly after Big Bend, Highway 164 crosses I-43 and County ES, which was once Highway 15 and the main road between Milwaukee and Beloit before its larger Interstate cousin was built. There are plenty of places to refuel – for gas or food. 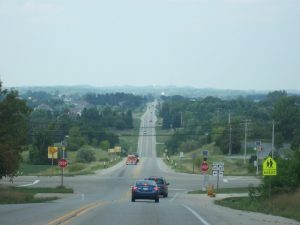 From this point north, Highway 164 is a recently upgraded four-lane highway that serves as a primary route into Waukesha coming from the south; lots of development is taking place along this stretch. This brings you to (by far) the largest city along Highway 164, Waukesha (pop. 66,840), which Money Magazine recently ranked 36th on its “100 Best Places to Live in the U.S.” list. Waukesha originally incorporated in 1846 as Prairieville and changed its name the following year. “Waukesha” means “fox” in the Potawatomi language, and the Fox River runs right through town. Waukesha is home to the oldest college in Wisconsin, Carroll College, which was founded in 1846 (the University of Wisconsin has established two years later.) The BoDeans, comedian Frank Caliendo, Olympic gymnasts Paul and Morgan Hamm, musician Kurt Bestor and author Vernor Vinge all hail from Waukesha to some extent, and Les Paul, inventor of the electric guitar, was born in the city in 1919. The bypass Highway 164 runs on today is named after him. 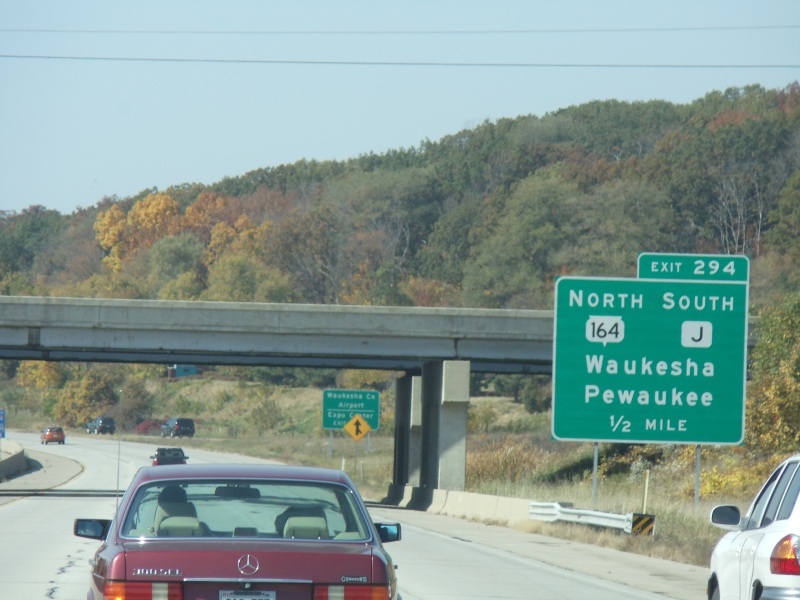 Approaching Waukesha, you have a choice between following the original Highway 164, which cuts right through the city, or the newer alignment that bypasses the city to the south and east (that’s the Les Paul Parkway we just mentioned). If you choose to go through the city, follow East Avenue straight into town, angle east briefly on Main and then north again on White Rock Avenue, follow Moreland Blvd (U.S. 18) west across the Fox River, and then north on County F all the way to I-94. Hey, nobody said it was easy. If you go through the city, explore downtown Waukesha a bit; it offers a wide assortment of shops, parks and places to see. Among them is the Waukesha County Historical Society & Museum (101 W. Main Street, 262-548-7186), which chronicles Waukesha ’s rather interesting history with water and mud. The springs in the village were believed to provide water that could, among other things, cure diabetes. Resorts were built to attract visitors to come and “heal” themselves with Waukesha ’s water. Attempts to pump Waukesha’s high-quality water to the 1893 World’s Fair in Chicago were almost successful – almost. During the first half of the 20th century, the Moor Mud Baths gave rise to the Grand View Health Resort, a precursor to today’s health spas. All of that and more are chronicled in the museum. The older parts of Waukesha, which downtown certainly is a part of, are known for wacky street layouts that some have described as “like a set of wheel spokes with no hub.” It’s easy to get lost, but you won’t stay that way for long. No, not a pass in a bar (although there are plenty of those in Waukesha bars). The first legal forward pass in American football took place in Waukesha on September 5, 1906. During a game against Waukesha’s Carroll College, St. Louis University’s Bradbury Robinson tossed up a pass which fell incomplete – a turnover under 1906 rules. Later in the game, he tossed a 20-yard touchdown pass. It was considered a way to make the game safer; the previous year, there were 19 fatalities nationwide in football and President Teddy Roosevelt threatened to shut down the game unless changes were made. 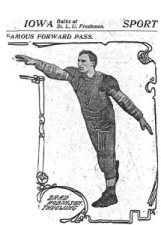 Right: A depiction of the Brad Robinson throwing the first legal forward pass, as shown in the St. Louis Post-Dispatch in 1906. 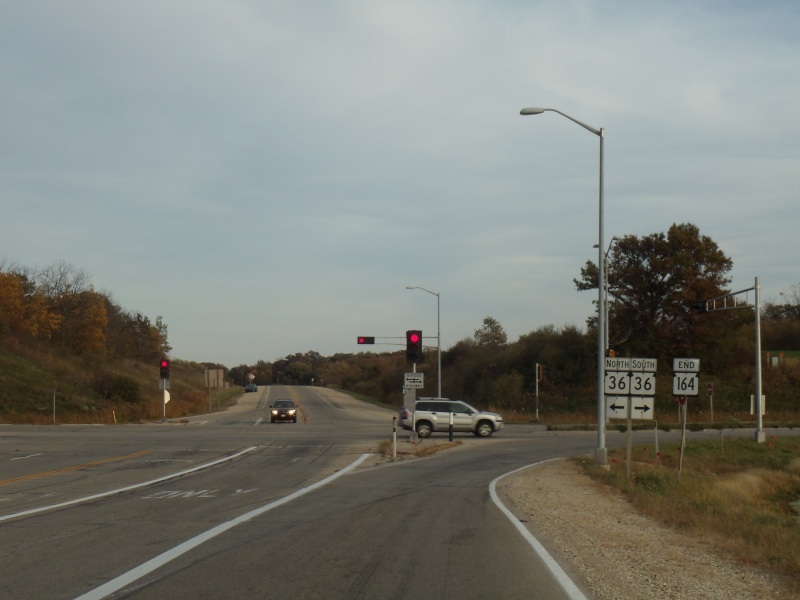 Currently, Highway 164 joins Highway 59 for the ride on the six-lane Les Paul Parkway around Waukesha’s south and east side. This is a newer, sprawling area of Waukesha. It pops you over to Arcadian Avenue quickly so you can head east toward Milwaukee. Highway 164 jogs a bit here; you follow I-94 west for a few miles back around the north end of Waukesha before departing the freeway onto a recently re-aligned 164, which proceeds north for the longer leg of the trip. For a few miles, Highway 164 follows I-94 to complete the semi-circle around Waukesha. You then head north on a newer alignment that will take you through the rest of Waukesha County and into Washington County. Rolling hills – some of which roll pretty high – rule the landscape in this part of Washington County. At the intersection with Highway 167, you get a nice view in any season. 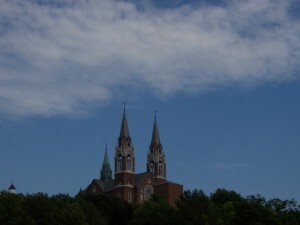 Just west of this intersection are the twin steeples of Holy Hill, a very prominent landmark. Holy Hill can be accessed via Highway 167 going west; the view of the twin steeples from the ground are awesome enough, the view from the steeples is even better! 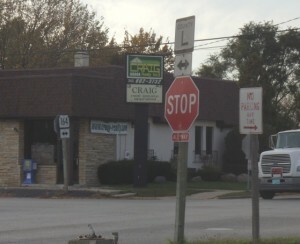 One mile north of Highway 167 is Pleasant Hill Road. A jog east briefly leads you to the Messer-Mayer Grist Mill, first constructed in 1871 and recently restored. Inside, a lot of original mining equipment can be found, much of it early equipment from the small machine shop that would eventually grow into Allis-Chalmers, a once-giant manufacturing company that built West Allis, Wisconsin and made much of the equipment that built the nation’s infrastructure throughout the 20th century. Tours are available June-August or by appointment (262-628-0252). A fun little stop on Highway 164 at Pleasant Hill is the Hairy Lemon Irish Pub (262-628-4645), where you can grab some refreshments. 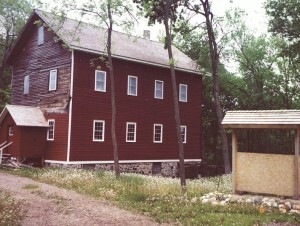 Richfield’s Messer-Mayer Grist Mill, which dates back to 1871. 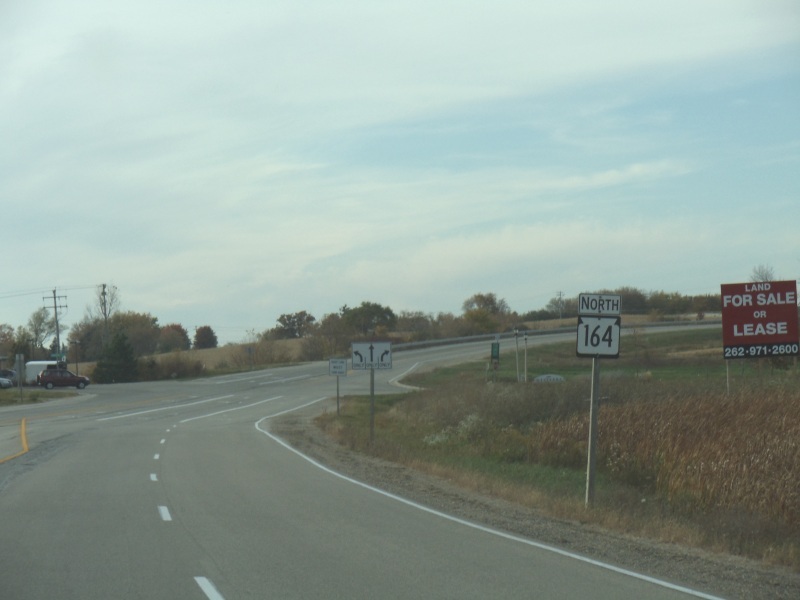 Further north, Highway 164 leapfrogs over Highway 175, the original U.S. 41. 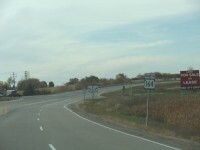 Shortly after that, Highway 164 ends at Highway 60, just west of junction with I-41/U.S. 41. Slinger is just to the west, like a hop, skip, and a jump.